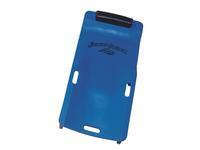 The new Lisle Low Profile Plastic Creeper body is 2" longer for a better fit. 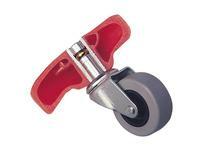 Urethane rollers are inserted into steel bushings which are molded into the Lisle Low Profile Plastic Creeper body. Provides added strength and easy roller replacement. Resistant to solvents, greases and fuels. Low profile, 7/8" floor clearance. Easy to clean surface is resistant to solvents, greases and fuels. 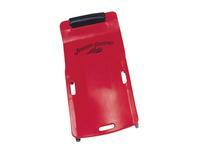 Dimensions: Length 38", Width 17 1/2", Height 4"
Low profile, 7/8" floor clearance. Easy to clean surface is resistant to solvents, greases and fuels. 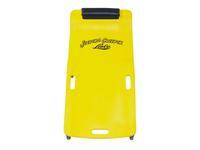 Dimensions: Length 38", Width 17 1/2", Height 4". Rated for between 250 -300lbs. Low profile, 7/8" floor clearance. Easy to clean surface is resistant to solvents, greases and fuels. Dimensions: Length 38", Width 17 1/2", Height 4". Rated between 250-300lbs.